For years, doctors have been telling us that pet ownership can improve our physical health and mental outlook, and in this Fit as Fido interview, Dawn Marcus, M.D. outlines just how to do it. Dr. Marcus's insightful book advises us to look at our dog's approach to life for clues on how to eat, exercise and even socialize our way to a healthier lifestyle. Sound intriguing? Read on to learn just how easy it can be. Fit as Fido Interview with Dawn Marcus, M.D. 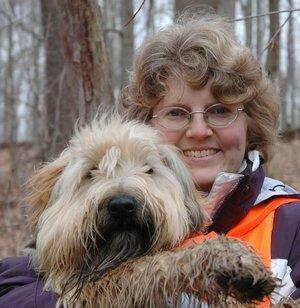 LTK: What inspired you to write a book about following our dogs' lead as a way to improve our health? Dr. Marcus: I'm a medical doctor. Once I began taking care of patients, I soon learned that you can't really impact people's health with just a pill or a simple prescription. You really need to address many aspects of lifestyle - eating habits, sleeping patterns, exercise routines, mood and stress, and relationship issues. For years, I'd been preaching to patients about how to improve these various aspects of their lives and how making changes would positively impact their health. 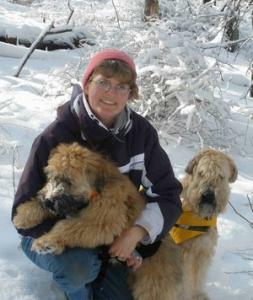 When a Soft-Coated Wheaten Terrier joined our household, my family and I found it was much easier to follow my recommendations and exercise right, eat properly and get to bed on time. We had to become more structured to help train the puppy and ended up training ourselves in the process. We also found that our Terrier helped us connect with neighbors and acquaintances we met on walks but with whom we previously hadn't bothered to stop for chats as we rushed from here to there. It was easy to strike up conversations when Wheatie was with us, and getting plugged into the neighborhood became a natural result. So for me, Wheatie became my teacher and "canine personal trainer", showing me how to put all of my years of knowledge into practice to become healthier and happier. LTK: Can sharing our lives with a dog really raise our fitness level, and if so, please explain how. Dr. Marcus: We all know that exercise is good for us - we just often find excuses to avoid it. Fortunately, our excuses don't work on Fluffy who won't accept being too busy, feeling stress, bad weather, too much laundry, bad hair day, etc. as reasons not to exercise. So, our dogs can be great motivators to stick with an exercise program. A study conducted at the Department of Clinical Veterinary Medicine in Cambridge showed that before people got a dog, they walked an average of twice per week. One month after getting a dog, walking increased to nine times per week! After six months, dog owners were now walking an average of fourteen times per week. LTK: Addressing physical fitness from Fido's point of view, what is it that dogs typically do differently from humans that we should try to emulate? Dr. Marcus: Let's break it down into three main areas. Eating: Dogs understand that food is for nutrition. People, on the other hand, often use food to fight stress, boredom and feeling depressed. Dogs know that the best remedy for feeling anxious, stressed or bored is a quick romp in the park - not an extra cup of dog food. Dogs also understand that special reward foods, like dog treats, are terrific when given infrequently for something special. You'll also probably notice that Lucky will work really hard to get a tiny training treat. And after you give her that little treat, she's off to her next task. When you want a special treat for yourself, follow Lucky's lead - take a small portion (like a fun-sized candy bar), savor the treat and then head off for your next task - away from the cookie jar. Playing: People often mistakenly believe you have to exercise about 30 minutes at a time and at high intensity to really get health benefits. Our canine personal trainers know better. Watch how Toby plays - he'll play fetch for 15 minutes and then take a break. Researchers at the University of Pittsburgh showed that Toby's method is actually ideal. In a study, they asked one group of overweight adults to exercise in a single 20 to 40 minute session five days each week. They asked a similar group of overweight adults to exercise for a total of 20 to 40 minutes five days each week, but they had to break up their exercise into several short, 10-minute sessions. After five months, the people doing the 10-minute exercise segments were exercising a total of 25 percent more than those doing one long session, and those doing the short exercise segments actually lost 40 percent more weight! So, two or three 10-minute dog walks each day are a perfect way to exercise. You're more likely to stick with it. You'll probably exercise more, and you'll even become trimmer. Sleeping: Dogs are great sleepers. Humans should sleep seven to nine hours each night to get the health benefits of sleep. Unfortunately, the National Sleep Foundation survey of adults found that the average person sleeps fewer than seven hours each night. Some good sleep hygiene tips for humans reflect how dogs treat sleep. You should set up a sleeping den for yourself, and use your bed only for snuggling with someone special and sleeping. You shouldn't use your bed for reading, watching television, talking on the telephone, etc. Don't substitute caffeine and food for sleep. Research shows that, although drinking caffeinated beverages may make us feel more alert, mental testing shows that we're still suffering from the ill effects of not enough sleep. Eating also doesn't replace the need for rest. When Ginger's tired, she doesn't head to the food dish; she plops down and sleeps. Don't be afraid to take a nap. Dogs are outstanding nappers and naps are great for filling in sleep gaps. Medical studies have proven that, just like Mom said, taking a short afternoon nap is healthy and actually reduces your risk of dying from heart disease. LTK: On the topic of staying mentally fit, what can we learn from our dog's approach to life that we should try to adopt in our own daily routine? Dr. Marcus: Socializing is important for our health. When we're socially connected, we're healthier and happier. And did you know that seniors with a strong social network of friends reduce their risk of dying by 20 percent? Wheatie has taught me a lot about good socializing. He'll never pass up an opportunity to meet and greet other dogs or people, and he's just as interested to meet someone new as an old friend. When he meets people, he really focuses on them and their needs, listening intently to all that they have to share. So when I'm tempted to cross the street to avoid chatting with a long-winded neighbor, Wheatie politely sits down, glued to his spot, insisting that we don't miss important opportunities for healthy socializing. And afterward, Wheatie continues happily in search of our next encounter and I usually find my day has been brightened a little more. LTK: Is there any final advice you'd like to add? Dr. Marcus: Dogs are wonderful for leading us in directions we might have otherwise missed. You can get out and involved by taking dog classes, visiting dog parks and even volunteering with your dog as a therapy dog. Wheatie will soon be performing in a local high school production of Annie, and we've spent many wonderful hours bonding together as he's learning new skills. We've also built up wonderful memories of the students who worked with him in the play who have also used this experience to start getting fit! If you don't have a dog in your life, you can still get benefits from dog companionship by offering to walk a neighbor's dog or volunteering at your local animal shelter. So grab a leash, whistle for Duke and start getting Fit As Fido! You can also visit LTK Exercise for more information on getting into shape. 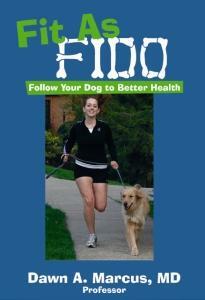 A copy of Fit as Fido was supplied for review at LTK Dogs by Dawn Marcus, M.D.